The 3rd Annual Chicago Biotech-Pharma Symposium. 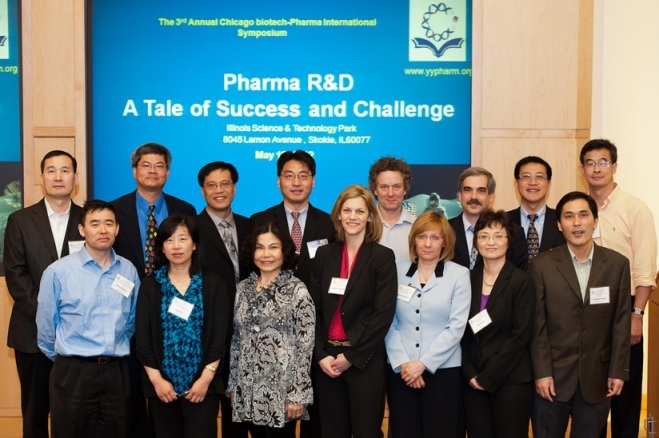 The 3rd Annual Chicago Biotech-Pharma Symposium was held on May 12, 2012 in the Illinois Science & Technology Park, north suburb of Chicago. The annual symposium series has been sponsored by Yaoyuan—Academy for Pharma Innovation, and organized by a group of scientists from pharmaceutical industry and academia in great Chicago area. Dr. W. Paul Mar, CEO of SynChem, Inc., chaired this year’s symposium. “Pharma R & D, A Tale of Success” was chosen as the theme of this symposium to highlight the critical path and future horizons in drug discovery and development. Six scientists who have played pivotal roles in the discovery and development of selected recently-approved drugs or associated diagnostic kit shared their exciting stories. More than 120 scienstists and professionals from pharma industry and academia attended the conference. Multiple scientific vendors held product shows at the Symposium. SynChem has submitted to US PTO its first patent application for the novel ADC linker technology. SynChem today announced that it has submitted its first patent application for the novel antibody-drug conjugate (ADC) linker technology. SynChem's technology can improve the stability of ADCs in physiology environment, decrease the aggregation and increase the solubility, challenges that many ADCs currently in development have encountered. This patent application is the direct result of SynChem internally funded research efforts. "We are very pleased to successfully advance our internal ADC new linker research to yield fruitful results and result in the patent application for this new technology. The research team worked hard on this project and it is an important milestone in our company. Armed with this new platform technology, we can provide our customers better and more comprehensive services to solve problems faster.." W. Paul Mar, SynChem's Chief Executive Officer. "Again, this confirms our commitment to our customers that we will continue to offer the highest quality services to drug discovery, biotech and pharmaceutical industries, not only with chemistry-focused operation to complete projects on time and on budget, but also with our internally funded research to add values to our customer's program. It also strengthens our commitment to society that we will continue our presence in the U.S. which has served our customers well in last 15 years"
Henlin Biotech management team visited SynChem, Inc.
Today SynChem welcome Mrs. Linjie Wang, Chairman of Henlin Biotech, Mr. Yinghua Wang, President of Henlin Biotech and other guests from Henlin Biotech. Mrs. Wang and Mr. Wang discussed with Drs. W. Paul Mar, Daniel Fang and ZQ Xu about the future collaboration between SynChem and Henlin in the field of chemical research and new technology development to better serve both companies’ customers. Both sides sign a memorandum of setting up a joint venture, Henlin-SynChem Inc.
"We are very pleased to setup a joint venture with Henlin Biotech so that we can utilize our own chemical research power in the technology upgrade in Chinese chemical industry. Teaming up with Henlin is one of the most important strategic for our future direction." said W. Paul Mar, SynChem's Chief Executive Officer. "The combination of research capabilities of SynChem and manufacturing capacities of Henlin will best serve our customers and will greatly benefit to both of us, especially to our technology upgrade and modernization." Said Mrs. Wang of Henlin Biotech.